Only a week to go … sneak peek time! Very exciting!! The new Spring Mini catalogue starts on 1 August 2009, and I think it is outstanding! Of course, I’m biased, but I think the colour combinations are going to delight your day, the price of the stamp sets will surprise you and the ideas will inspire you. This card is made using one of the Christmas stamp sets – Tree Trimmings. The simple Pacific Point and Whisper White colour scheme looks effective, don’t you think? And I love, love, love the Filigree brads! I also found my Stamp-a-ma-jig invaluable in stamping the string in the right position – and the sentiment. Although you can’t really notice it in this photo, I have stamped the baubles on Whisper White and then cut them out and stuck them on with dimensionals. The sentiment is from the stamp set Best Yet (very versatile!) and perfect for Christmas cards. One of the best things about being a demo is that I have the opportunity to purchase from the Spring Mini a month in advance of customers. But it will be your turn soon! Do you know someone who loves Stampin’ Up! products? Why not arrange a Gift Certificate for them for their next birthday or for Christmas? This is a Gift Certificate holder I made recently … your friend could receive something like this! How special will they feel? And what could be really special? Make your own! I’ve used the colours Pretty in Pink, So Saffron, Almost Amethyst and Certainly Celery. The stamp sets are One of a Kind and Fresh Cuts. The ribbon is Basic Grey taffeta. And the punch is the gorgeous Eyelet Border punch. Email me at rachel.capps@yahoo.com.au to arrange a Gift Certificate any time, anywhere in Australia. It was a great card because you could use the same cardstock in different layouts. 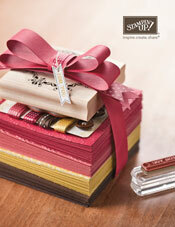 The stamp sets used are One of a Kind and Life Definitions and the DSP is Bella Rose. Did you know that the small circles in Sticky Cut Letters fit a Build-a-Brad perfectly? I’ve built a chunky brad using my Sticky Cut Letters, Build-a-Brad and Chunky glitter. The colour combo is Riding Hood Red, Pink Pirouette and Kiwi Kiss. So, what is your opinion? Green glitter or pink glitter for this card? Do you have blogs you like to visit all the time because they always inspire you? Well, one of my favourite blogs is DOstamping with Dawn. Dawn always inspires me with gorgeous cards and projects. You should check her out here. But today, this card was inspired by Dawn’s post here. I have used the stamp sets Together Forever, One of a Kind and Short and Sweet in this card. The colours are Riding Hood Red, Very Vanilla, Kiwi Kiss and Handsome Hunter. I have used textured cardstock which lends a real elegance to the card in real life. And the ribbon? Ahh … something on my wishlist for sooo long – Riding Hood Red/Very Vanilla wide striped grosgrain. It will be available for purchase in Australia on 1 August when the Spring Mini starts. Contact me if you want some too! For the twins’ birthday cards, Jenne has used the stamp sets Garden Whimsy and Think Happy Thoughts for the girl’s card and Sincere Salutations with the Large Star punch for the boy’s card. And the ribbon is also Stampin’ Up! grosgrain. The ribbons look great, don’t they? This card is for a housewarming. For this card, Jenne used the Trendy Trees stamp set. Jenne said her friend’s new house had lots of trees, so Trendy Trees suited the occasion just right! Although the patterned paper is not Stampin’ Up!, I think Jenne has matched it awesome with the stamp sets she has used. Thanks for sharing with us, Jenne! This is the same layout I used for my Dad’s birthday card, except I’ve used the flowers from Sticky Cut Letters and added a stem with Three Little Words (using my Old Olive marker pen). I adore the Fine Supernova Glitter … these two colours are a big WOW for me! The sentiment comes from Short & Sweet and I’ve used the new scalloped oval punch, which will be available from 1 August in the upcoming Spring Mini Catalogue.